Immutable nature of string is charecterised by it’s property that one’s a memory location is reserved (allocated) to a string and if string value changes then old value is not over written by new one. For example : Create an instance of type String as s1. Now let’s change the content of s1 ,in case of primitive data type like int, float , char etc .If we change the containt of one variable the privious value is overwritten by the new value, but in case of String type instances this is not possible ,here a new memeory location is created which will point to the new value as shown.. This behavior of String Instances is reffered as Immutable nature of String. 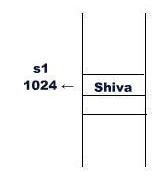 Shiva, if you create a String “not”using new, it will be placed in the string pool. String bString = new String(“I am a Masters, Comp Sci student at Univ. of California”; //This does a heap memory allocation since we have used a “new”.